Chamilia presents this beautiful pendant necklace inspired by Belle from Disney's classic tale Beauty and the Beast. 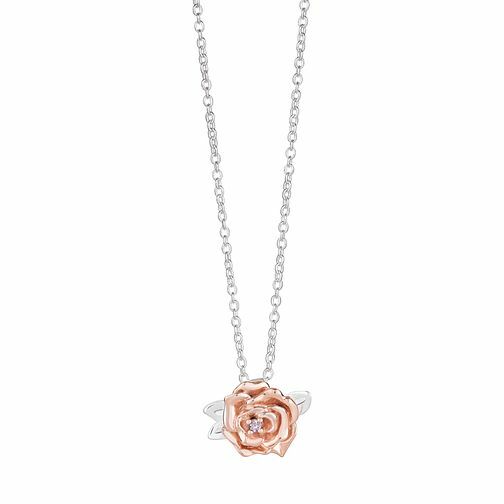 Crafted from shining sterling silver and luxurious 9 carat rose gold, this gorgeous necklace features an intricately detailed rose, perfect for any Disney fan. Discover all the ways to express yourself with Chamilia. Chamilia jewellery is as unique as you are! Chamilia Disney Beauty & the Beast Rose Pendant Necklace is rated 4.9 out of 5 by 11. Rated 5 out of 5 by Anonymous from Perfect mother’s say present Fantastic quality, perfect mother’s day gift. Our little girl is called Rosey so is amazing and then my favourite film is beauty and the beast - hubby did AMAZINGLY! Rated 5 out of 5 by Anonymous from Necklace looked very stylish Neatly packaged and was a great gift for my girlfriend.